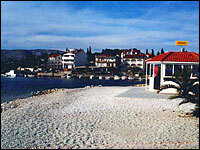 Okrug Donji, a tourist destination on the island of Ciovo that is connected to the town of Trogir by bridge, lies 40 km from Split and is, along with the whole area, known for its numerous bays and beautiful beaches, very popular with children due to their shallow waters. Okrug Donji is ideal for families looking for peace and quiet, while the town of Trogir nearby offers plenty of interesting events. 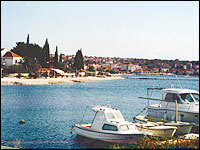 Sports facilities can be found in the town of Trogir, while water sports equipment, for those who do not have their own, can be rented on the beaches of Ciovo. How to get there: 2 km south of Trogir on the local road towards Ciovo and Okrug Donji Okrug Gornji is located on Ciovo, a central Dalmatian island, which is connected to Trogir by a drawbridge. Inhabited since prehistoric times, the island is home to a rich cultural heritage, while its beaches are encompassed by crystal clear sea, making it an attractive destination for many tourists.